Gratings are often used for coupling light out of or into lightguides. How to optimize the coupling efficiency is always an important issue in such cases. The coupling gratings usually have feature sizes comparable with the wavelength and therefore require a rigorous modeling technique. VirtualLab Fusion provides convenient tools for the configuration of the grating structures, the rigorous Fourier modal method (FMM) for grating analysis, and also the parametric optimization method. With the combination of these technologies, a practical workflow for coupling grating optimization is presented. 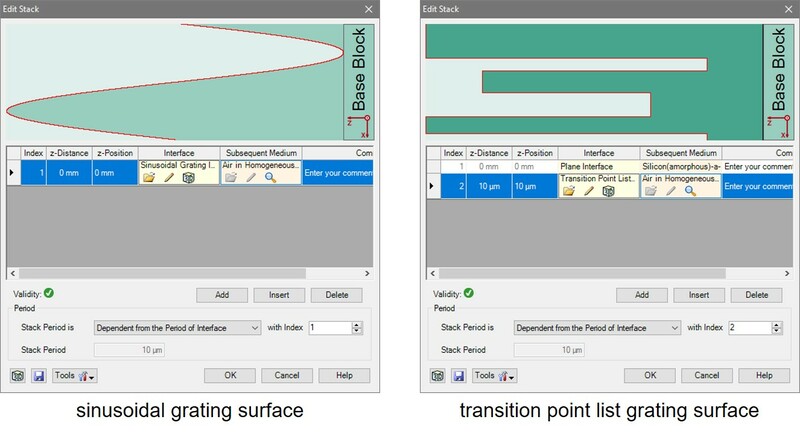 We demonstrate the design workflow for optimizing a rectangular grating for one specific incidence direction to obtain maximum efficiency for a specific diffraction order. In VirtualLab Fusion, grating structures are configured in a “stack”, which can be constructed with either a sequence of interfaces or special media, depending on the geometry of the grating. In this use case the configuration of grating structures based on interfaces is explained. Newsletter/News LightTrans, VirtualLab, optimization, coupling gratings VirtualLab Fusion provides convenient tools for the configuration of the grating structures, the rigorous Fourier modal method (FMM) for grating analysis, and also the parametric optimization method. With the combination of these technologies, a practical workflow for coupling grating optimization is presented.